As soon as you believe or realize that you may have a flat tire, pull over and park your vehicle in a safe location away from traffic. If you have to pull over on the side of the road, make sure to park as far away from traffic as possible and to put on your hazards. Next locate your spare tire, lug wrench, and jack. If you're not sure where these are, your owner's manual will tell you. Place the jack behind or in front of the flat tire. Ensure that the jack is under the metal part of your vehicle and not the plastic molding. Remove your hub cap and begin loosening the lug nuts by turning them counterclockwise with the lug wrench. Make sure to use force to loosen the lug nuts. You may have to hit the wrench arm with a rock or heavy object. Be sure to only loosen the nuts and not remove them! Using the jack, raise your car off the ground until the tire is elevated by just a few inches. Keep an eye on it to make sure that the car is lifting straight up and the jack isn't tilting – you don't want anything falling! Also, make sure that there is enough space for you to put the spare tire on. Next, remove the lug nuts completely and put them in a safe area where you won't lose them, and pull the tire off of the car. Make sure to pull it straight towards yourself. Now place your spare tire on the car and put the lug nuts on in their correct position. Use your wrench to tighten them, turning them clockwise this time. 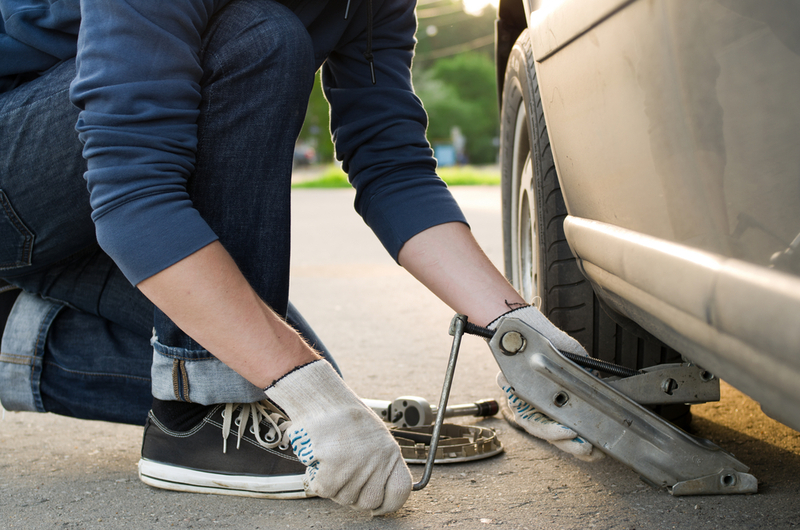 Lower your car carefully back to the ground using the jack and then remove the jack from under your vehicle. Check your lug nuts one last time to ensure that they are not loose. Also, be sure to put your tools and the flat tire away in your trunk or inside your car. After driving a few miles, you may want to stop and ensure that the lug nuts are still tight. While you can drive with your spare tire, remember that it's just that – a spare, and it's designed to be driven for a certain period of time. Visit our website at Tires By Web to conveniently shop for new tires, including multi-mile tires, Vogue tires, Vredestein tires and more at discounted prices.